Did Mr B relent or hasn’t he seen it yet? He was at work when I bought it. He wasn’t sure about me sending W to nursery in it but then got swamped by all the girls cooing over him when he dropped him off and, strangely enough, doesn’t seem to mind it so much now! 😉 Bring on the elf and the reindeer suits I say! Ah bless, that is gorgeous! That’s sooo cute!!! He seems to like it too! He does, it is really snuggly! You got the outfit then – good on you, he looks absolutely gorgeous!! happy halloween what a cutie!!! LOL, I used to love the Smashing Pumpkins, remember gish? 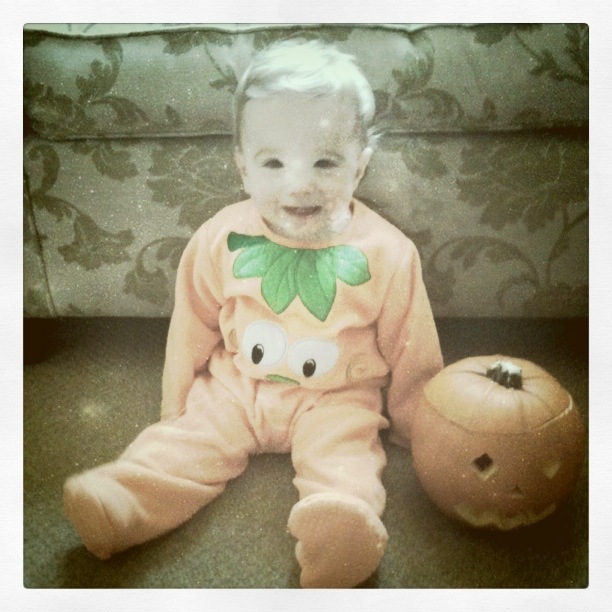 Ahhh, Halloween baby, so cute!! oh now THAT is too flipping cute! All set to go, where are the halloween treats Mum? What a gorgeous pumpkin – the one on the left! Ah, that is lovely. Must remember to get my pumpkin in the morning! *chuckles* I want me one of those! #broody!